A reliable source for Explosion Proof Vacuums information and a resource for accessing leading Explosion Proof Vacuums and suppliers. Explosion proof vacuums are industrial vacuums specifically designed to clean hazardous and flammable liquids and solids without the risk of fire. Every component in their design is made of non-sparking materials like fiberglass and stainless steel, significantly reducing the risk of static charge or a spark from material impact. Explosion proof vacuums are utilized by manufacturers of solid organic materials like sugar, corn starch, wood or plastic pellets because they risk serious fires if the dust they produce becomes finely divided and dispersed. Polishing, grinding, transporting and shaping many different materials produces dust and small particles, which become dispersed around facilities and can easily catch fire. Areas that contain flammable gas or vapor are also subject to extra caution while vacuuming. Ignition of these materials is not uncommon; it can be caused by hot surfaces, electrical sparks, flame or glowing embers, metal-to-metal contact and static electricity. 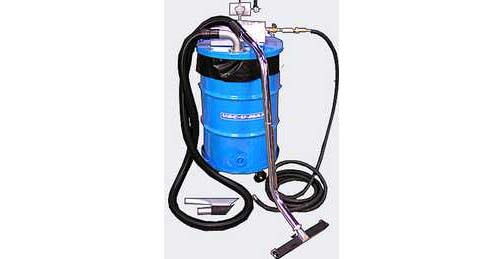 Most explosion proof vacuums are powered by compressed air instead of electricity and can handle wet or dry materials. One of the largest causes of vacuum fires is large amounts of fine dust. If the dust is regularly cleaned, the risk of fire goes down, but it does not disappear. Static dissipation, electrical insulation and chemical neutrality are all important factors in explosion proof vacuum construction. The housing can be made of reinforced fiberglass or stainless steel, and components like inlets and casters are often made of plastic or bronze. Inside the vacuum, an immersion separator quenches the material with water, eliminating the risk of combustion within the storage tank. There are also filters to reduce airborne dust. In order to be considered fully explosion proof, vacuums must reach strict US National Electrical Code 500 and 505 standards. Some may claim to be explosion proof, but unless they are certified, using them could be unsafe. There is a rating system of classes, divisions and groups put fourth by the NEC that matches certain hazardous environments and materials with the appropriate vacuum type. All hoses, tools and attachments must be static conductive, dissipative and fully grounded so there is no risk of sparking during operation.